I first became interested in heavy rock music when I was about 15 years old, when I discovered the sounds of Van Halen, AC/DC, Def Leppard and Bon Jovi. I started buying Kerrang! magazine every week to find out more about these bands (no internet and the mag was great then!) and I bought vinyl albums or borrowed them from my local library. My first proper gig was Def Leppard at Sheffield City Hall in 1987, which set me off on my lifelong passion for heavy rock and metal; I just loved the whole atmosphere of being amongst the crowd and seeing my heroes up on stage! Whenever I could, I went to as many gigs as possible; local bands and luckily all the ones I was into during that late 80’s / early 90’s period such as AC/DC, Aerosmith, Judas Priest, Megadeth, KISS, Motley Crue, Motorhead and on….still into them now actually, though some more than others and my taste has broadened a lot since then. I love discovering all the great new bands out there, but will always have a passion for the classic metal bands. So continued my love of rock and metal and it has always been a constant presence in my life, a lifestyle in fact. Therefore it was brilliant for me when in 2011 that passion turned to something I could actually put into practice, which was to have a go at presenting my own online metal show which I loved doing! Then I was also asked to join the online metal magazine Metal Shock Finland, which now consists of a small team of amateur journalists from around the world, who bring the latest news, reviews and interviews to the metal loving public. I love my role there as Senior Manager and also Utilifests Manager; I arrange partnerships with metal festivals around the world and update the readers with regular news. I have also been very lucky to conduct many interviews; many in person at shows, also phoners or via Skype. It has always been an absolute pleasure talking to musicians about their careers and discovering what new delights they will be delivering to the fans! I would say up to now my favourite interviewees have been Wolf Hoffmann (ACCEPT), Michael Schenker, Tony Martin (ex BLACK SABBATH), Mathias Nygård (TURISAS) and Swedish metallers WOLF. They have all been completely down to earth, funny at times and have wanted to talk, not just a quick answer, which of course is fantastic to pass onto their fans. Although not a professional journalist, I take my role seriously, work hard and always give it my best. 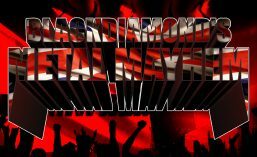 At the end of 2012 I joined the all new Bloodstock Radio, now back to TotalRock, presenting my weekly Blackdiamond’s Metal Mayhem every Tuesday morning from 10am, but more recently (late 2015) at the new time of 6PM Tuesday evening. As I don’t live in London, I can’t present from the studio, but thanks to technology (which can sometimes be problematic!) I present from home and I love it; especially being able to play new tracks to the listeners on a regular basis, whether from established or unsigned bands, or lesser known bands from around the world. If you haven’t heard my show, I play a mix of metal,(never nu metal!) but mainly on the heavier side. That said, on occasions I may play something a little lighter if I choose to and also plenty of classic metal such as Accept and Judas Priest. Also included in the shows are any of my latest interviews that I think people would like to hear, plus the latest news from the metal world. Thanks to the fantastic people at record companies, I can play a great selection of new tracks before albums are released. My aims are to keep on delivering up to date information and releases to rock and metal music fans in as many ways as possible. The music industry is a very difficult one to make any money in, but I will always keep working as hard as possible to achieve my goals and be successful. If you want to get in touch with me please email aliblackdiamond@hotmail.co.uk or send a message via my official Blackdiamond’s Metal Mayhem page on Facebook. I’m always interested to hear from new bands too!